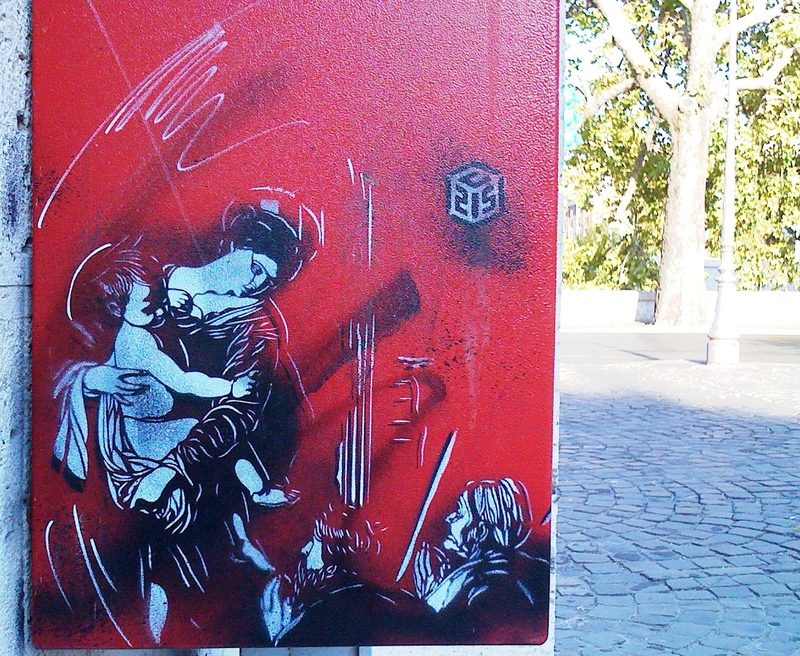 I shot this stencil by French street artist C215 while in Rome last year. It was on the outskirts of the Vatican. In the video below, C215 discusses what inspires his work and also what happens when street art is photographed and distributed on the internet. He has a laissez-faire attitude to these transactions: "I have no scruple stealing an image from (the) internet. If they are published, available to me, to anyone even for a screen capture and my action is non-commercial," C215 says in the clip. He modifies the original images, which essentially removes copyright infringement liability. "Anyone can take a photo of my creations, share it on the internet as well and it can be stolen by someone else," C215 adds. Therefore, when street art meets the internet it becomes a hotbed of "sharing". This is a nice way of saying humans/Facebook accounts are prolific thieves.